Father’s Day is Sunday and what better way to show the man in your life how much he means to you than by preparing one of his favorite foods homemade burgers, with The Ultimate Southern Style Burger! Hamburgers have a long-standing and well-deserved tradition of being one of the most popular foods in America. 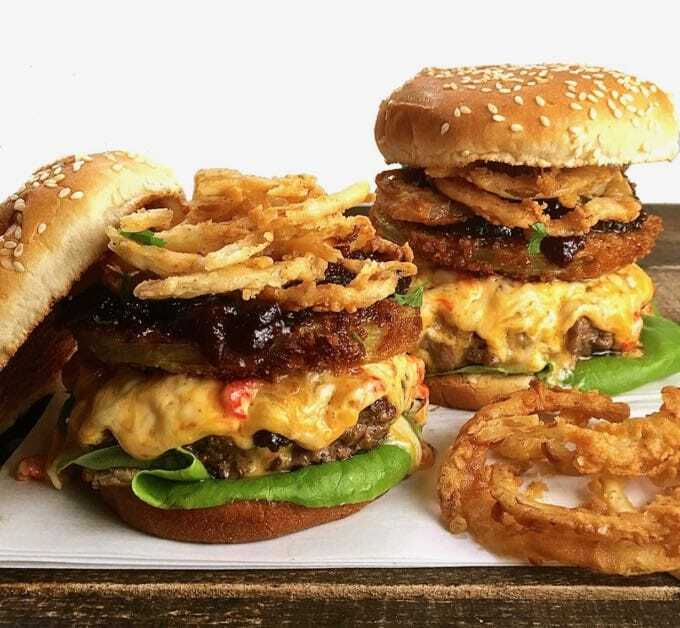 And, it should come as no surprise that dear old Dad would most likely love to take a break from grilling this year and have a unique burger on his special day. 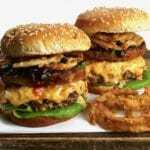 The Ultimate Southern Style Burger recipe offers a unique Southern twist to a classic beef burger or homemade burger recipes and incorporates all things Southern, including melted savory pimento cheese, yummy fried green tomatoes, crispy and oh so crunchy onion rings, and tangy sweet and savory tomato jam. You won’t believe how juicy and flavorful this easy burger recipe is and the man in your life will love it! Yes, I know, it’s a little over the top, well maybe a lot over the top, but trust me on this, the combination of flavors and this award-winning burger recipe will rock your burger world. The Ultimate Southern Style Burger does have a few moving parts which take a little time to prepare but, it’s so worth it. However, if you are short on time, you can always substitute store-bought pimento cheese, canned onion rings and ripe tomato slices for the fried green tomatoes. I also thought about giving you a recipe so you could make your own tomato jam, but even I know when I’ve gone too far… You should be able to find this delicious condiment at your local grocery store or maybe even at a farmers market. I promise, after you taste tomato jam, you will never put regular catsup on your burgers again! The ingredients for The Ultimate Southern Style Burger include ground beef, kosher salt and ground black pepper, peanut or canola oil, Kay’s Southern Pimento Cheese Spread or pre-made pimento cheese, Easy Southern Fried Green Tomatoes or sliced fresh tomatoes, Southern Style Crispy Onion Rings or a can of fried onions, lettuce, hamburger buns, tomato jam or catsup. 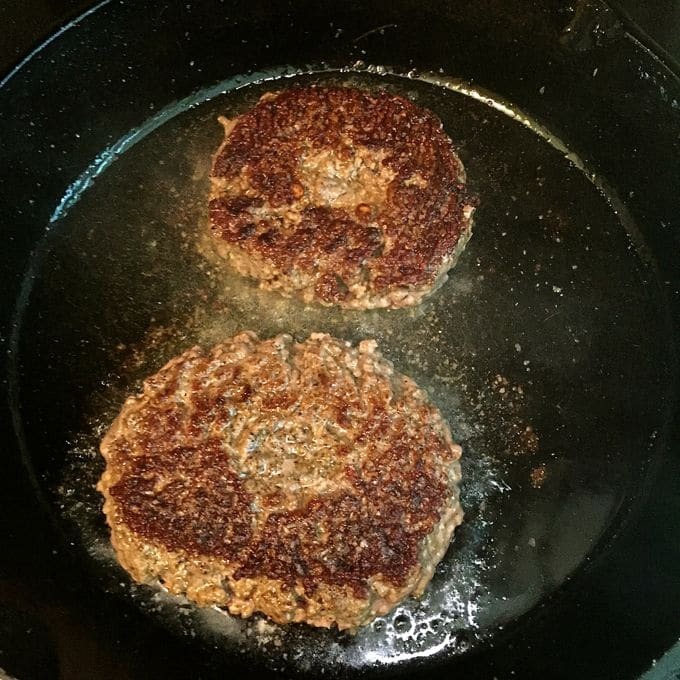 Season the patties on both sides with kosher salt and pepper. If grilling the hamburger patties, preheat your grill to high and oil the grates. Grill the burgers for about 3 minutes on the first side, flip them over and cook for an additional 4 minutes or until they are cooked throughout. Top with 1/4 cup of pimento cheese during the last minute of cooking and allow it to melt. Remove the burgers from the grill and keep warm until you are ready to assemble. If cooking the burgers inside, use a cast iron skillet and preheat over medium-high heat. Add the oil and when it is hot, add the patties. Cook the burgers for about 3 minutes on the first side, flip them over and cook for an additional 4 minutes or until they are cooked throughout. 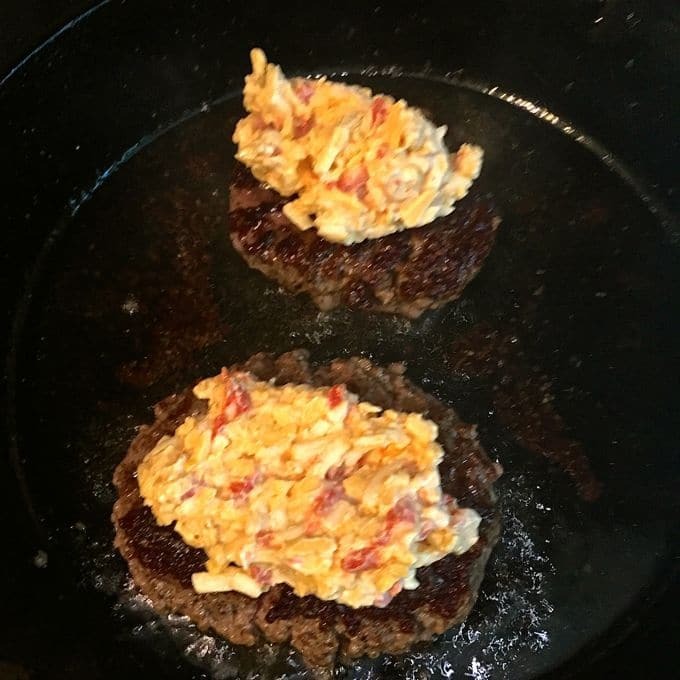 During the last minute of cooking top the burgers with 1/4 cup of pimento cheese, place a lid on the pan and let the cheese melt. Remove the burgers from the pan and keep warm until you are ready to assemble. If desired, toast your buns on the grill or under the broiler. To assemble the burgers, spread one tablespoon tomato jam on the bottom bun. Add lettuce and top with the burger and melted pimento cheese. 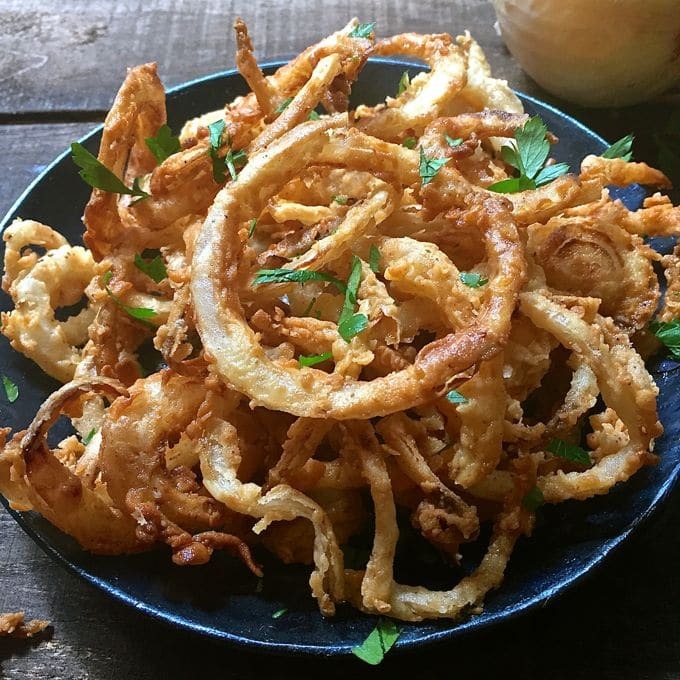 Add a slice of fried green tomato, a handful of onion rings and top with another tablespoon of tomato jam. Add the top bun and serve immediately. If you liked the recipe above, please consider rating it and leaving a comment below. Also, follow me on Pinterest, Facebook, and Instagram. And finally, to be the first to receive notifications of new posts by email enter your email address here or in the Subscribe box. Thank you so much for visiting Grits and Pinecones! The Ultimate Southern Style Burger offers a unique Southern twist to a classic hamburger and incorporates all things Southern, including melted savory pimento cheese, yummy fried green tomatoes, crispy and oh so crunchy onion rings, and tangy sweet and savory tomato jam. If grilling the hamburger patties, preheat your grill to high and oil the grates. Grill the burgers for about 3 minutes on the first side, flip them over and cook for an additional 4 minutes or until they are cooked throughout. Top with 1/4 cup of pimento cheese during the last minute of cooking and allow it to melt. Remove the burgers from the grill and keep warm until you are ready to assemble. If cooking the burgers inside, use a cast iron skillet and preheat over medium-high heat. Add the oil and when it is hot, add the patties. Cook the burgers for about 3 minutes on the first side, flip them over and cook for an additional 4 minutes or until they are cooked throughout. During the last minute of cooking top the burgers with 1/4 cup of pimento cheese, place a lid on the pan and let the cheese melt. Remove the burgers from the pan and keep warm until you are ready to assemble. Thanks so much Elaine! It is delicious but unfortunately not something you could eat every day!!! This burger looks and sounds amazing!! Love the onion rings and pimento cheese!! Thanks so much Kathryn! It’s over the top but delicious! Oh my…there is so much fabulous happening in this burger! 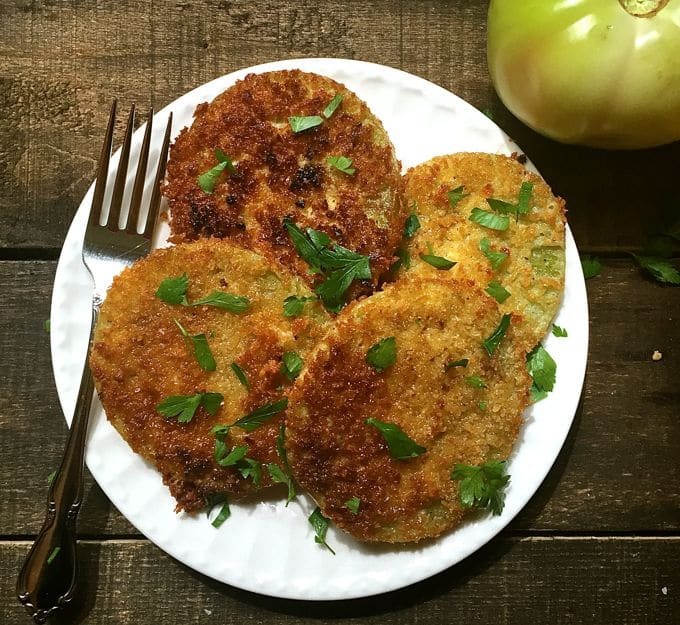 I’ve never tried to make fried green tomatoes, but I do love them. This burger is going on my to-do list!! Hi Karyl, I do hope you like it. The fried green tomatoes are easy to make and they add a great taste to this burger! Oh my gosh!!! I’m originally a Yankee from Wisconsin (we KNOW cheese! ), but as I was looking for a burger idea I came across yours!! I’m thoroughly against putting Ketchup on any good meat that I grill. But tomato JAM? I spent most of my life in Texas, and I have yet to see Tomato Jam. But I will certainly scour the Internet for it! 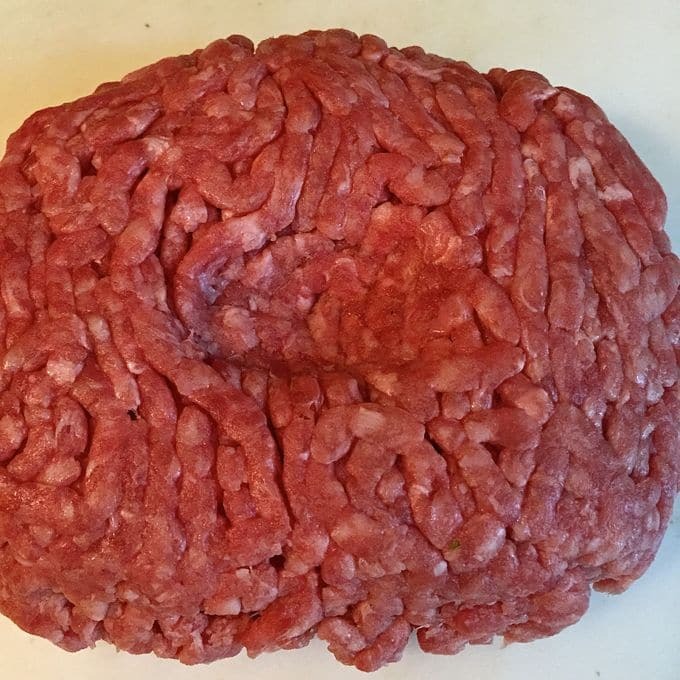 Your’s is the best burger recipe I’ve found yet! Keep up the good work. I’ll have to see if my girlfriend will consume fried green tomatoes! LOL! Have a blessed day! I’m so glad you like my southern burger. And, I know you will become addicted to tomato jam! It is delicious on so many things. Thanks so much for leaving such a kind comment!